I decided to make my interest in quilting a bit more useful in 2010 and made a couple of quilts to give as Christmas gifts. The first of these was for Keith and Karen (andPepper!). With all of them keen on sailing I decided a nautical theme was in order and came up with all kinds of ideas, some of which I actually used! Having chosen the picture of a yacht to use, I enlisted the help of my other brother to enlarge it to fit the available space, and also to be in scale with the picture of the black labrador I had managed to find on half a metre of fabric at a quilt show last summer! I had to show Pepper sitting on the deck! The center panel was appliqued and then the borders were attached around the edges. 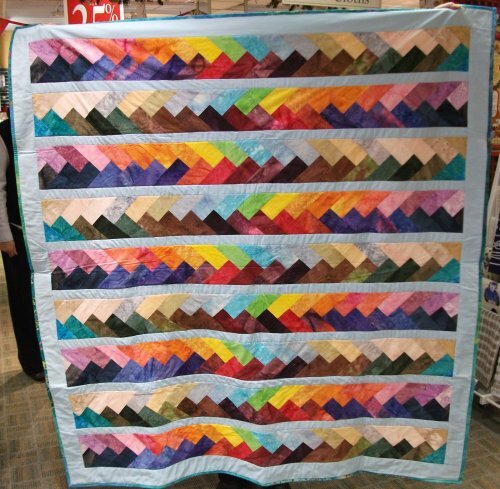 I originally got the idea for this quilt when I purchased the pebble fabric on a visit to Truro. 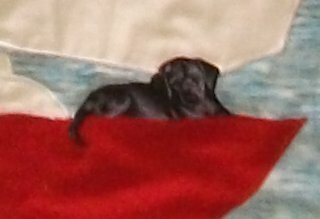 I had initially thought of trying to embroider a dog on the deck but when I found the labrador fabric I did breathe a sigh of relief. Much easier to apllique one instead! Not the clearest photo but you get the idea! The second quilt I made was given to my sister-in-law, Maggie. I based the design on one I had seen in a book but modified to work with the quantity of fabric I had to use. The braids are made from bright batik fabrics. The original design had all the braids running in the same direction and next to each other. I felt the overall design here looked better with a strip of plain fabric between the braids. The binding was also done in the batik fabric. I was really pleesed with the finished results of both these quilts and I am planning to make another couple this year. Not sure yet who will get them or what fabric I will use but it is only February! In the meantime though, I am going to have a go at some freeform crochet and see if I can make a dent in my yarn stash! It has been a while since I updated this blog so it is high time I added photos of the various projects I have made so far this year! 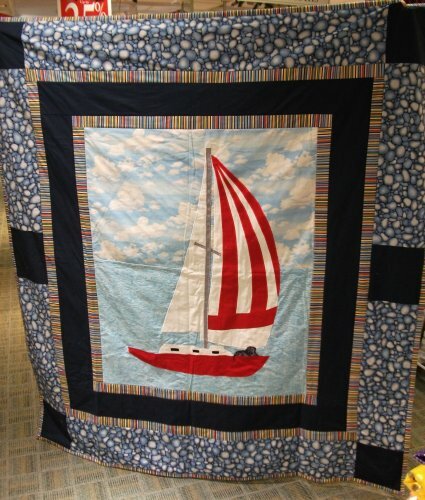 The first two photos are of cot quilts I have made for displaying at work. They are both based around pre-printed panels to which I have added borders. For the Hungry Caterpillar quilt I used strips of the pre-printed border fabric to increase the size of the panel to fit a baby’s cot. The next one is a Farmyard quilt. I adapted the pattern from the one which appears on the suppliers website because we would not be stocking the full range of fabrics. This one is also a cot size quilt. The next one is a Pirate’s Treasure Map playmat. Again, this was an adaptation of the pattern on the suppliers website. The next project was a couple of costumes. One is a cute Halloween themed costume for a baby. The second costume was a Cinderella dress for an older child. This one was not really enjoyable to make and I think that is entirely due to the fabrics used. However, it looks effective, which is he point of the exercise! The Tinkerbell costume was made by a colleague. For a friend’s birthday, I made this small butterfly brooch using the butterfly yo-yo maker by Clover. The fabric used is an ivory cotton with metallic gold in a random pattern. The butterfly body is made with clear, gold and brown crystals.